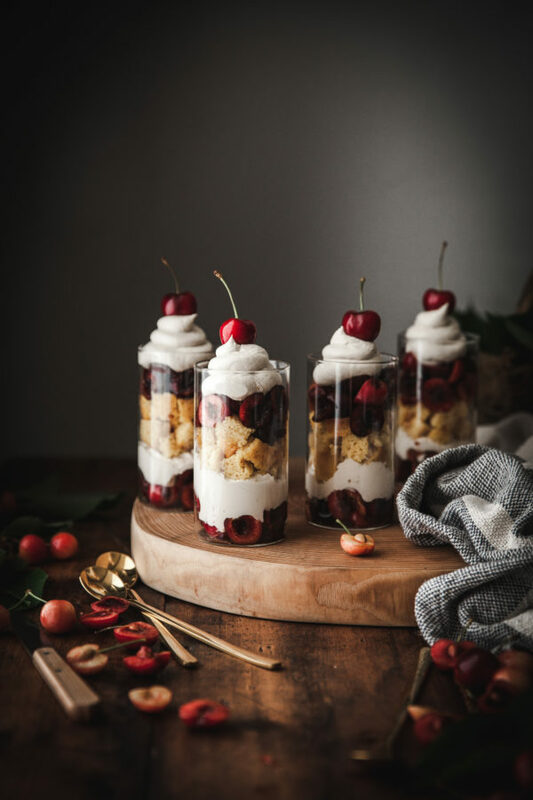 These Coconut Cream + Lemon Pound Cake & Cherry Trifles are gluten and grain free, refined sugar free, paleo, and have a dairy free option. 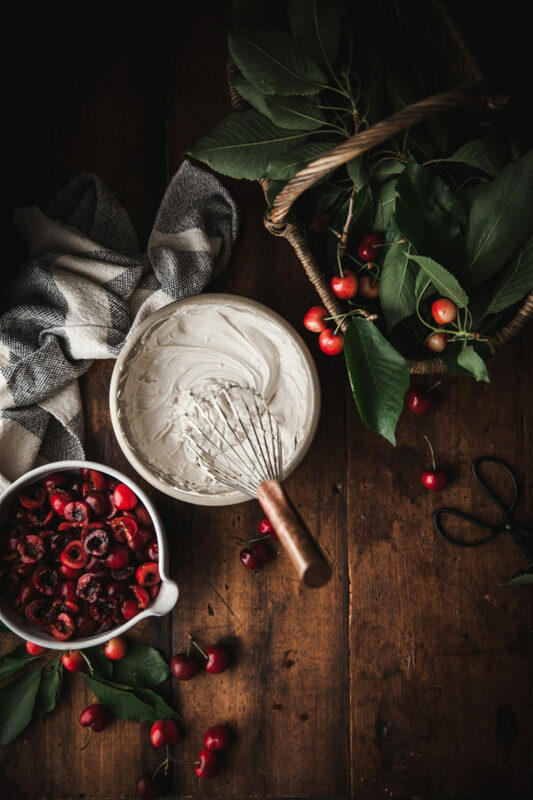 It’s officially that time of year – I’m picking cherries by the basketful thanks to an abnormally good crop on my trees and now it’s time to put those cherries to use! 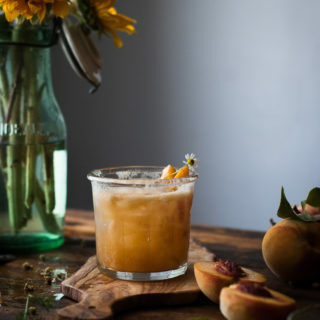 Today I’m sharing a simple yet stunning recipe that would be perfect for a summer party. 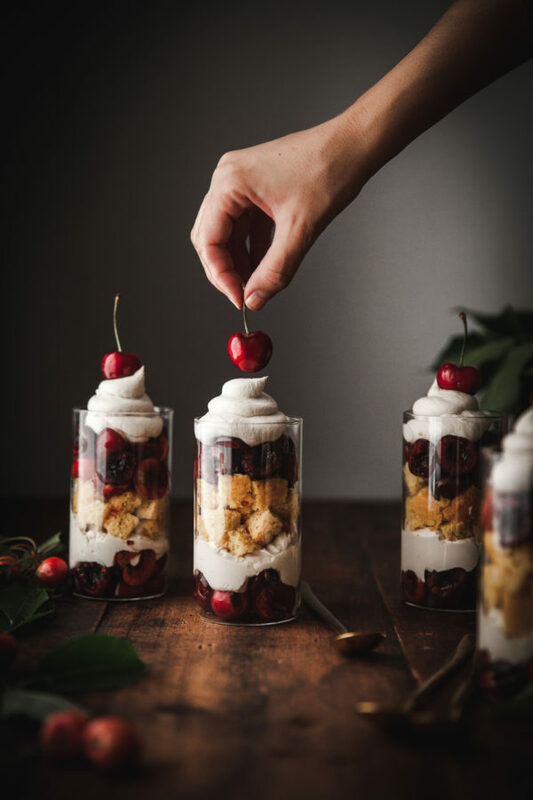 These trifles are ultra clean and consist of layers of homemade coconut cream(get my recipe HERE), fresh cherries(I linked to the pitter I use below the next photo), and a lemon pound cake that is grain free and so very easy to whip up. 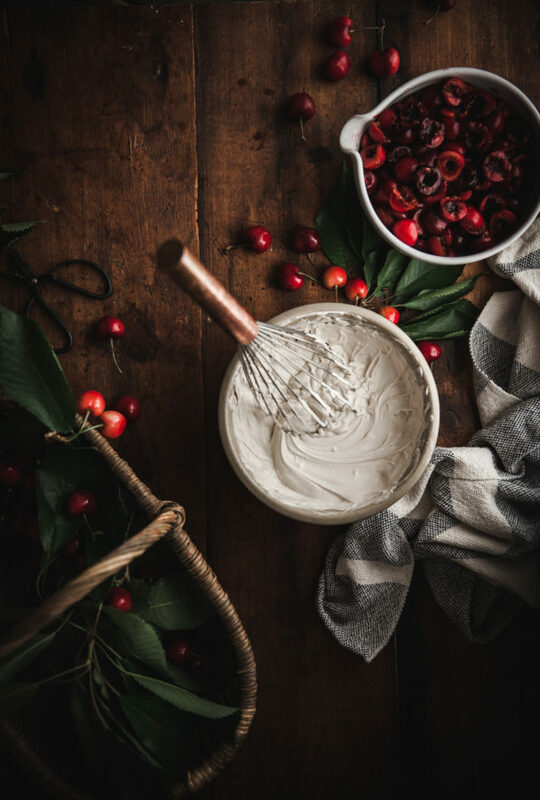 The coconut cream is so refreshing and creamy and could even pair with just the cherries themselves. 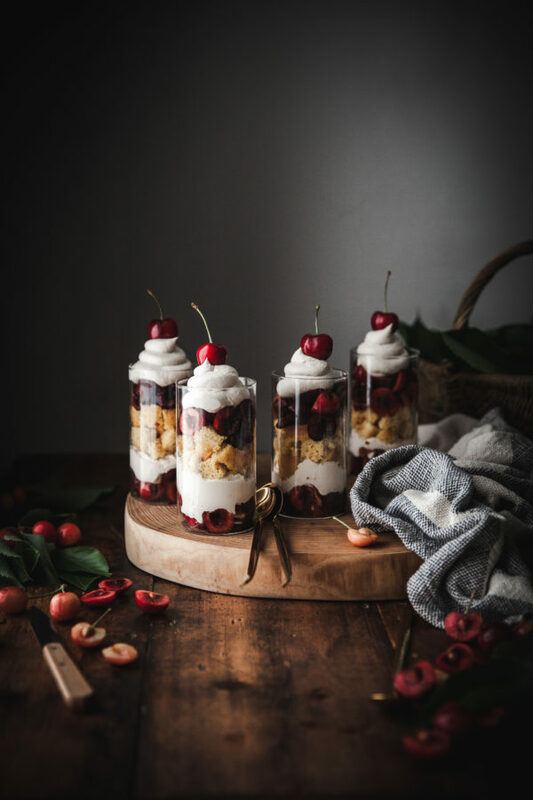 Taste your cherries before layering them into the trifles. If they are a little tart you’ll want to toss them with honey, per the recipe below. If they are super sweet cherries then you can probably get away with not putting any sweetener on them at all. For a more substantial dessert, however, the pound cake is key. The cake itself doesn’t take that long to make and bake, under 45 minutes, really. The one thing you’ll need for this dessert if you’re planning on making the homemade coconut cream is time. Sure, you can just buy canned coconut cream and it will work, and the dessert will be good. But if you want it to be stellar, make the cream! 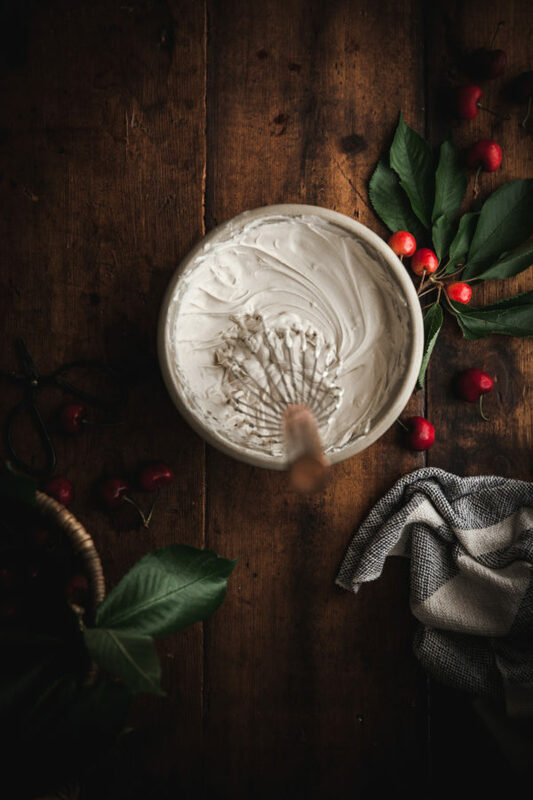 You’ll need to give yourself about 2 days in advance of assembling the trifles because the cream starts as a liquid and over the two day it separates into a water on the bottom with the cream on top(see recipe for details). The extra time it takes to make the cream is so worth it, I think. It tastes like vanilla ice cream! 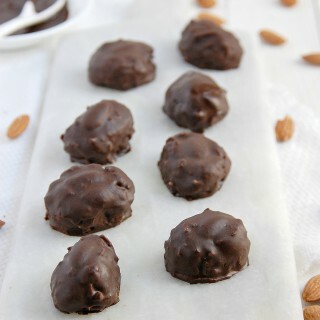 And, it’s sweetened with dates, so WIN. 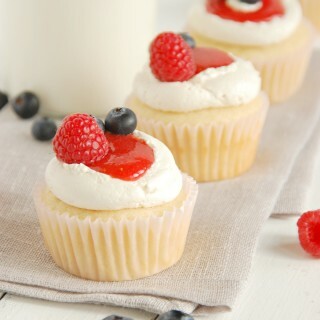 You can make this recipe into 6 large trifles or 12 smaller trifles, depending on your needs. I served mine in these pretty little Farmhouse Pottery glasses that are my favorite lately. But you could also use little mason jars. 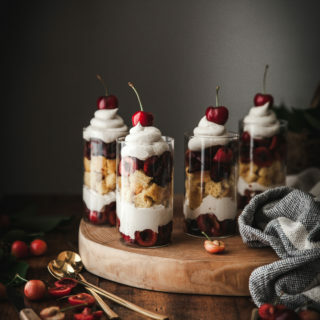 Oh, and any cherry will do for these trifles! I used dark red Bing cherries for these, but I think Ranier would be really nice as well. 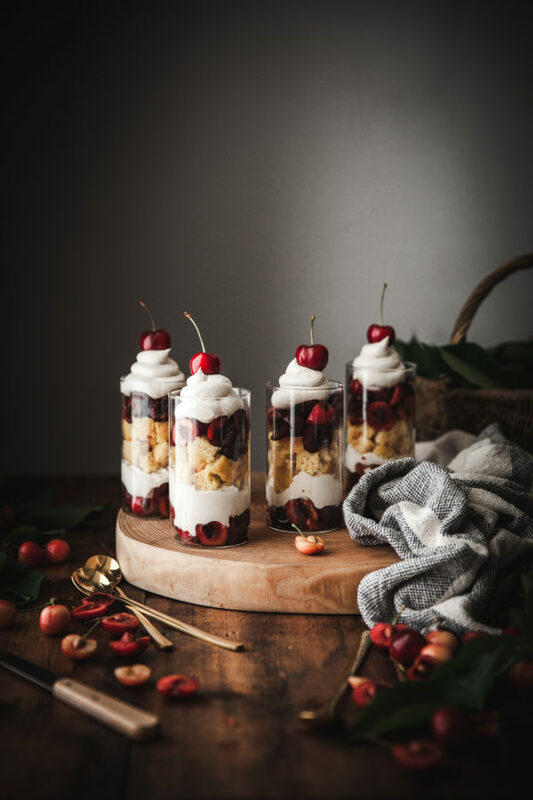 *If making the coconut cream from scratch per my recipe(which I highly recommend), give yourself two days notice to make it before assembling these trifles. The coconut cream mixture needs those two days to separate and set. *makes 6 large parfaits or 12 small. Preheat the oven to 350 degrees. Line a standard loaf pan with parchment paper(so that the paper hangs over the sides). Place the eggs, melted butter, honey, lemon zest, and lemon juice in a mixing bowl and whisk together until smooth. 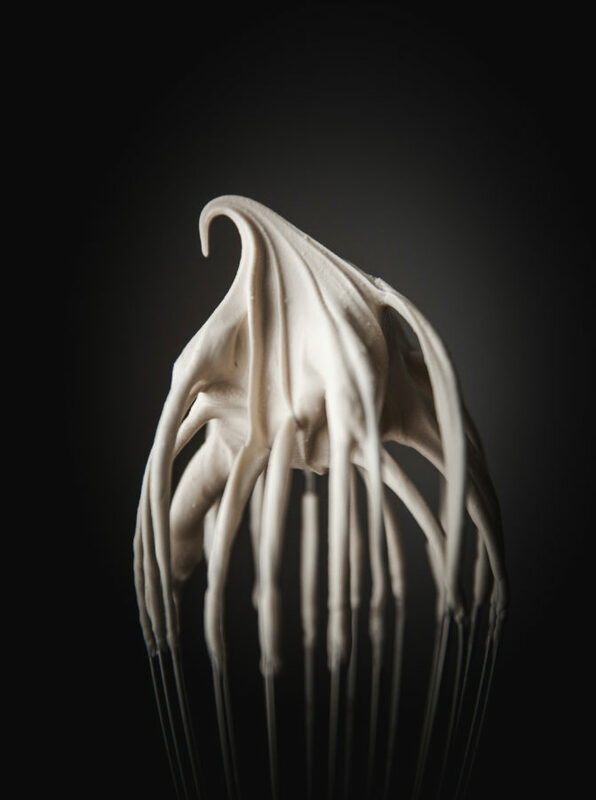 In another bowl, whisk together the dry ingredients. Add dry ingredients to the egg mixture and whisk until smooth. Let batter sit for 5 minutes to allow the coconut flour to absorb moisture. Whisk again and then pour the batter into the prepared loaf pan. Bake in the preheated oven for 35-40 minutes, or until a tester inserted into the center comes out clean. Remove from and let cool. Lift edges of the parchment paper to remove cake from pan. Peel the parchment off of the sides of the cake and cut the cake into small cubes. 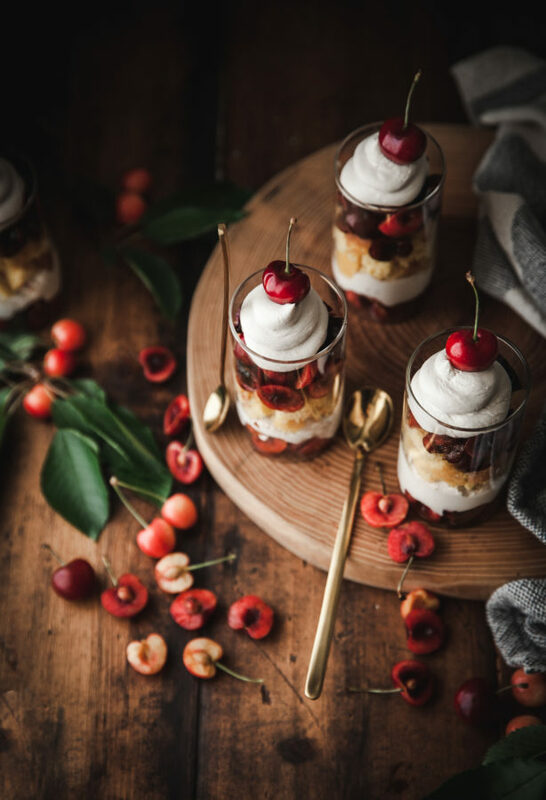 Place cherries in a large bowl and drizzle with honey. Toss to coat. Place the coconut cream in a piping bag fitted with a round tip. NOTE: if you haven't already, drain the liquid from the bottom of the cream and place the hard cream in a bowl. Beat it with an electric mixer until it is smooth and creamy(it should be very thick). 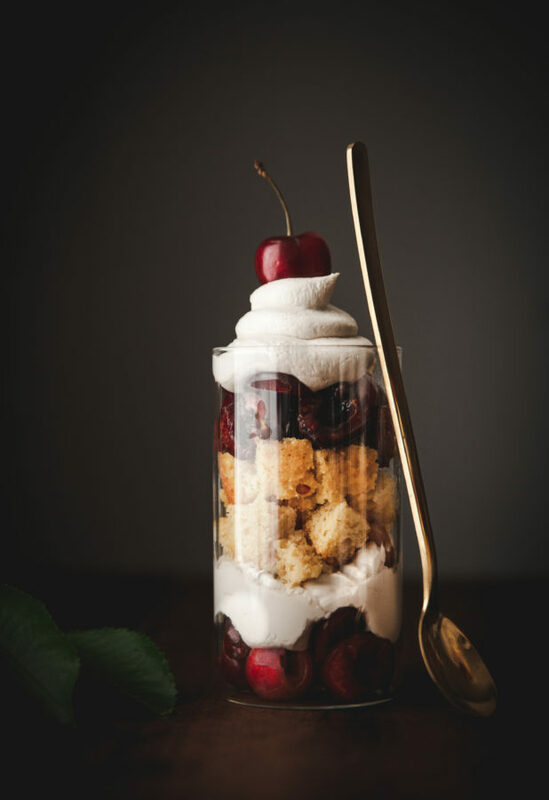 Using either 12 small or 6 large glasses, layer spoonfuls of cherries, swirls of coconut cream, and cubes of lemon pound cake in each glass as desired. 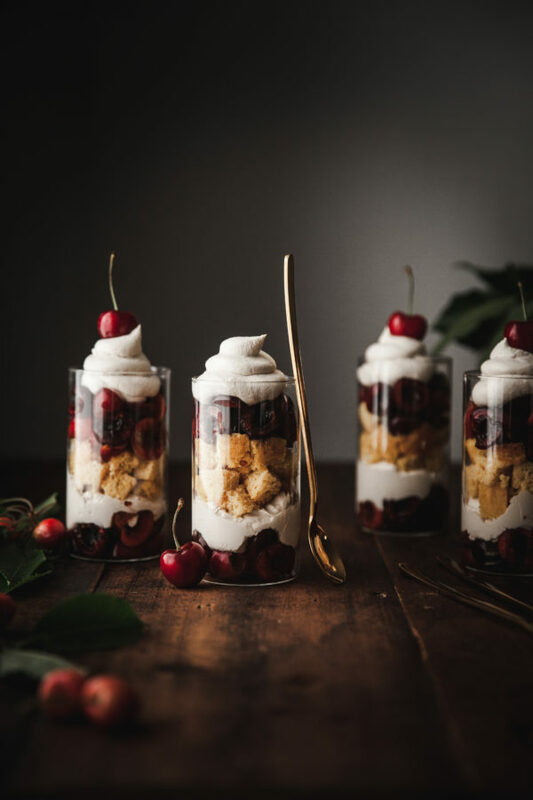 Top each trifle with a whole cherry.